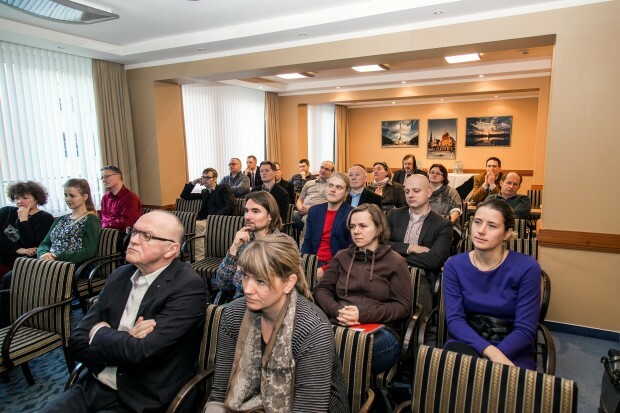 On December 8, 2014 the final DredgDikes workshop took place in the Steigenberger Hotel Sonne in Rostock. The meeting combined the final official meetings of the steering and monitoring group and a workshop for future project cooperations on EU level. Prof. Saathoff welcomed all participants in Rostock, followed by four presentations about the project results from Rostock and Gdansk. Then Dr. Cantré led a discussion about the DredgDikes guideline, to which the participants contributed with many helpful comments. In the afternoon, Mr. Graage and Dr. Hiller (Steinbeis Team Nordost) spoke about future EU funding possibilities for topics associated with the DredgDikes project, followed by a group workshop in which two main project ideas were developed for application in an EU funding programme. The meeting was summarised by Prof. Saathoff and Prof. Sikora and the intensive work of the project partners as well as all contributions by associated organisations and contractors were very much appreciated. The day was concluded with a joint visit of the Rostock Christmas market.